I love job ads. I just found a study on them that I feel silly for missing. Sorry! It shows that speaking to a candidate’s needs in a job ad gets you 13.6% more applicants than focusing on the skills your job requires. In other words, focusing on THEM beats focusing on YOU. Not only that — you also get higher quality candidates when you focus on the candidate’s needs! The study is called Does Emphasizing Different Types of Person–Environment Fit in Online Job Ads Inﬂuence Application Behavior and Applicant Quality? Evidence from a Field Experiment. I know: long title. But it’s legit. It appeared in the Journal of Business and Psychology in June 2014, authored by Joseph A. Schmidt, Derek S. Chapman and David A. Jones. Copyright by Springer Science+Business Media. Go check it out. But I have to warn you: it took me 2 hours to read (it’s pretty technical with a lot of math). Perhaps you’re a quicker study. In case you don’t have time to review it yourself, I’m delighted to share the top nuggets with you. The main theme is simple. Your job ads should focus more on things that a CANDIDATE needs rather than the skills that YOU require of them. The study recommends that you use more “Needs-based” content in your job ads. Each line of content is focused on what the candidate (not you) needs. 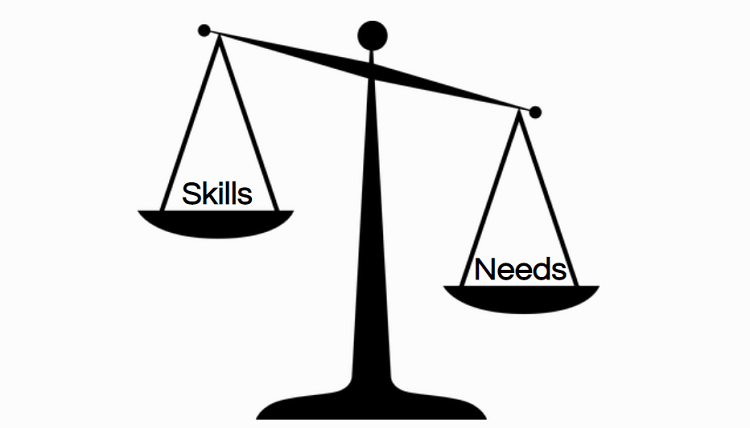 The commonality of skills-based content is that it is focused on what you (the employer) needs. The study consisted of 56 job ads posted by the Canadian head ofﬁce of a large multinational engineering-consulting ﬁrm. They used the job board Workopolis. Candidates viewed the job ads 18,047 times and 1,088 job seekers applied to one or more of the ads. The ﬁnal sample size was 991 after some duplicates were removed. The job ads were coded for 3 position types: engineering (20 positions), technical design (15 positions), or project administration including cost estimators, planner/schedulers, project accountants, and administrative coordinators (21 positions). The apply rate for the Needs job ads was 6.84% (13.6% higher than the 6.02% apply rate for the Skills-based job ads. And the quality of applicant was better too. When the applicants were measured for quality, the proportion of highest quality applicants (7.81 %) for the Needs-based job ads was higher than the 2.70 % for the skills-based job ads. Finally, the candidate perception of employer was also higher when the job ads were based on needs versus skills. In other words, the employer brand was judged better by the candidates viewing the needs-based job ads (even though it was the same employer for all job ads). In conclusion, when you write your job ads you want to focus on what the candidate (not you) needs. So, speaking to candidate needs (and not just your own) wins the day. Ongig’s mission is to hire you the best candidates through the best job content. So this great study is right up my alley!